The team at Edmunds.com paired up with the family experts of Parents magazine to determine a top ten list of the best family vehicles, the appropriately named “Best Family Cars for 2014,” and it gives Central Illinois Honda Dealers an incredible sense of pride to see that two of our favorite family vehicles made the list: the 2014 Accord and 2014 Odyssey. 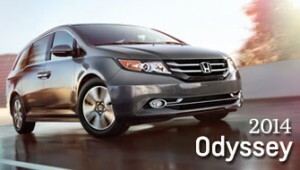 Many drivers think of the minivan as the essential family vehicle, and just taking one glance at the 2014 Odyssey will tell you why. Not only is it able to easily seat whole families—and often some friends too—but if you don’t need all of that seating, it’s easily convertible to cargo space. Add in Honda’s suite of modern amenities, from Bluetooth to a rearview camera to a touchscreen infotainment system, and we think it’s clear that this is the minivan of the modern family. Unique perks like the HondaVac vacuum at the Touring Elite trim level are just icing on the cake. One of Honda’s longest-running vehicles, the Accord seems to keep getting better year after year, and the 2014 model sure supports that. Featuring Honda’s revamped definition of “standard features,” the Accord is available in four different styles—two hybrids, a sedan, and a coupe—as well as two different gasoline-powered engines for the sedan or coupe drivers. The sedan received particular attention from Edmunds.com and Parents magazine for its ability to comfortably seat up to five with its spacious back seat while also offering plenty of storage space in the trunk. The best way to know if a family vehicle is right for you and your household is with a test drive. Visit a Central Illinois Honda Dealer today and let one of our sales team members put you behind the wheel for some quality time with a brand new Honda. Why not try out one of these two remarkable vehicles?